I remember the first time I saw it……I was amazed. That huge motor home, slowly making its way through the campground, gently rocking as it wound its way to the temporary site. Effortlessly, the pilot backed into the campsite and shut the unit down. Before the entry door was even opened I saw four strange looking legs of steel being thrust ground-ward like some type of morphing kid's toy. With a slight, subtle shudder, the coach settled into a perfectly level position. Yep, automatic levelers, electric or hydraulic are a luxury to be admired. But what about the rest of us? What exactly do we do when we set up camp after each traveling day? Well, before addressing the basics of leveling your RV, let's understand why the rig needs to be leveled in the first place. Certainly our camping comfort is at issue. It would not be appealing to sleep with our heads lower than our feet or to be constantly struggling to keep from rolling into the wall or worse yet, the spouse. And consider the inconvenience of having the eggs roll off the galley countertop every morning. 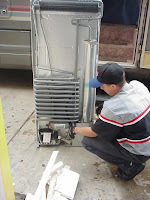 The primary reason for leveling any modern RV is to enable the absorption refrigerator, specifically the low-temperature evaporator coils in the refrigerator, to function properly. Due to the dynamics of the RV absorption refrigerator, the evaporator coils inside the cooling unit must permit the gravity flow of liquid ammonia through a portion of the system. And as any RVer who can spell "RV" will know, liquids simply won't flow uphill. Without getting too steeped into the theory of absorption refrigeration, suffice it to say that it can indeed be costly if the refrigerator is operated off-level. True, newer cooling unit technology incorporated in today's RV refrigerator employs a more vertical approach to evaporator positioning, still the refrigerator must be "relatively" level for optimum operation. Fore and aft as well as side to side leveling remains a concern. But, you say, it is so difficult to check the level of the refrigerator with it stuffed full of food. This is true also, so try this: Before beginning a trip, with the refrigerator empty, place a circular bubble level either in the center of the shelf in the freezer compartment, if the refrigerator indeed has one, or in the center of the bottom of the freezer compartment if there is no shelf in the freezer. Next, level the coach so that the bubble is in the exact center of the level. Then, permanently mount a set of corresponding levels anywhere that is convenient for you. 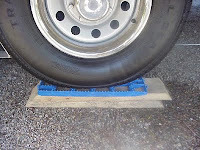 In many travel trailer applications, mounting the levels on the exterior corners on the front of the trailer, near the hitch, is most convenient. (For and aft leveling of a travel trailer or fifth-wheel is accomplished by manipulating the tongue jack or landing jacks). For motor homes, mounting a set of level indicators near the driver's compartment makes it easy to monitor your "levelness" while you drive up onto a set of leveling blocks. It matters not how level the counter top in the galley is, or how level the floor of the RV is, or even how level the casing of the refrigerator is, it's the evaporator portion of the cooling unit that counts. Bi-directional, mountable bubble levels are available in a myriad of configurations and price points at any well-stocked RV parts store. Also, remember this; most RV manufacturers simply create a hole in the cabinetry in which the refrigerator slides. RV refrigerators are purchased in quantity from the supplier or distributor and most coach manufacturers simply insert one into the cabinet opening, screw it down and send the coach on down the assembly line. Some RVs have refrigerators that do correspond to the levelness of the floor, but others may not be so fortunate. And this is one area where guessing is not encouraged. For specific information concerning just how far off-level a particular brand of refrigerator can be, contact the technical support people at that refrigerator manufacturer. (You'll find a detailed manual for the refrigerator inside most owners' manuals.) Avoid listening to wives tales around the campfire. Each manufacturer has its own set of specifications for its model line. If your refrigerator happens to be one of the older types, make it as level as you can. Don't risk ruining the cooling unit. Take a few extra minutes to verify just how level you are before operating the refrigerator. Perhaps it will save you a wallet-full of dollars better spent elsewhere. Okay, now that you have a permanent set of levels conveniently installed, stay aware of them as you set up camp after each day of travel. Here's how. 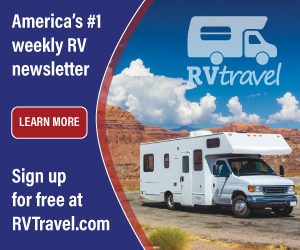 For those RVs not equipped with electric or hydraulic levelers, the only option is to run one, two or three of the tires up on blocks in order to obtain the optimum level position. Always keep one tire firmly on the ground. Keep in mind most modern campgrounds have relatively level spaces to begin with, but you will still have to be prepared for some of the older campgrounds or for those off-the-beaten-track dry camping sites you like to visit. There are some aftermarket products designed to actually lift the tire of the RV, but the majority of users still resort to blocks. Typically, most RVers carry a small assortment of wood blocks in varying dimensions for leveling the coach though there are some fine aftermarket products consisting of interlocking, stackable plastic blocks that are quite useful, but at a more substantial cost. Wood blocking is less expensive and easily obtained. Though not a necessity, but for extended usefulness, purchase pre-treated lumber for cutting into individual blocks. Usually 2 X material cut to varying lengths is all that is necessary as long as you can stack them high enough for a worst-case, off level site. Here's the key; the blocks should be long and wide enough to support the complete tire footprint. And with multiple blocks under one tire, the bottommost block should be the longest and widest with each additional block slightly shorter. They can all be the same width. This will create an easy-to-climb ramp of sorts. Determine exactly how many blocks will be needed at each tire position that requires lifting. It may take a few attempts to obtain the optimum level position. After a few times though, this step will become second nature as you gain expertise. Place the block(s) against each tire (back or front, depending on which direction you're headed), making sure when two or more stacked blocks are used they are offset slightly in order to maintain the ramp-like configuration. Start the RV (or tow vehicle), release the brake, engage the transmission and allow the engine idle speed to power the unit up the ramp of blocks. If the ramp is three or more blocks high, it may be necessary to use the accelerator some to ease the rig up the ramp. Keep one foot on the brake and stop when you reach the exact center of the top block. Here's where good communications with your co-pilot really pays off. Once stopped, verify how level you are by referring to the permanent levels you installed earlier. If level, place the transmission in Park, stop the engine and set the parking brake. It is now safe to operate the refrigerator. Here's an example of improper blocking. Notice how only the center of the tire is supported. Indeed this will raise the RV, but it will also severely weaken the sidewalls of the tire over time. An unsafe driving condition could develop. One of the worst habits to develop is using inappropriately sized blocks for leveling the coach. This is not only a poor leveling technique; it also is doing irreversible damage to the tire. The weakest portion of any tire is the sidewall. In the photo above/left, the tire bulging over both sides of the block puts undue stress on both sidewalls. Prolonged use of incorrect blocks will substantially weaken the sidewalls, thereby creating an unsafe driving or towing condition. Tire safety should never be compromised or jeopardized. Here's an example of a properly blocked tire. Notice how the block ends have a tapered cut. This is a good practice since it lends itself well to keeping the stack ramp-like. Notice also that a ribbed plastic block is used as the uppermost block. This is highly preferred since the use of untreated lumber has the propensity to retain moisture and grow mold. The tire remains high and dry even during extended stays in rainy locations. (It is also recommended to cover the tires completely when staying for extended periods in areas with high levels of ozone and/or ultraviolet radiation). When leveling a motor home with dual rear wheels, it is a good practice to use boards wide enough to cover the complete dual footprint. Don't leave the inside dual tire just hanging there. The same line of thinking should be applied also to travel trailers. 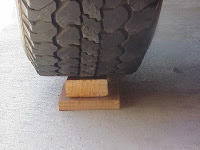 If one side needs lifting, use blocks under the tires of each axle on that side. 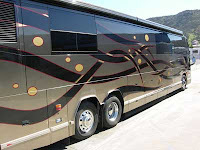 Be aware of the difference between leveling the RV and stabilizing the RV. They are not the same thing. 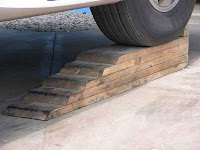 Leveling the RV literally lifts the coach by raising the appropriate tire positions to obtain the degree of levelness needed to operate the refrigerator safely. Stabilizing jacks are used to eliminate RV bounce once the coach has been leveled. Though some RVs may come equipped with stabilizers, they are not designed to actually raise the RV. Rather they should be considered beneficial for stabilizing the RV or slide-out. Aftermarket stack jacks, scissor jacks or screw jacks are a definite plus; they are simply not adequate for leveling the RV. The levelness of the low-temperature evaporator inside the refrigerator-the main reason for leveling in the first place. Use wooden planks or aftermarket blocks to raise the RV to the desired height. Always keep at least one tire on the ground. Protect the tires by using the correct size blocking. Add stabilizers to eliminate RV bounce. And finally, save your nickels and dimes for that cool set of automatic levelers! Remember, RVing is more than a hobby - it's a lifestyle!